We believe that by personally experiencing condors up close, people become more interested in learning about and eventually helping them. For this reason, we are very lucky to have trained condors which are willing to make public appearances. 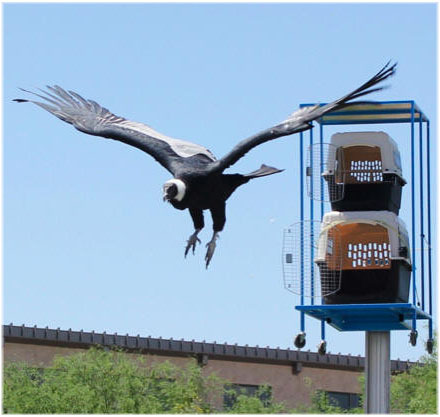 Using only positive reinforcement, we have succeeded in getting our condors accustomed to flying over audiences, taking direction from their trainer, and entering airlines approved crates for short periods of travel. For longer visits, such as for a summer show at a zoo or park, the condors stay inside our customized trailer where each one has a 7 foot high walk in aviary. 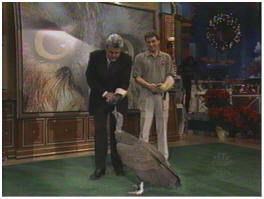 Because condors are top heavy and have little grip in their feet, we do not believe in using leashes. We allow out condors to walk freely whenever it is safe to do so. 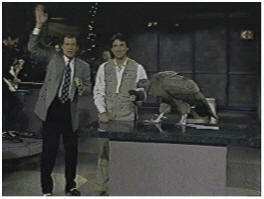 Our advanced condor training techniques have allowed us to bring condors to many millions of people all over the United States with the goal of teaching everyone about these huge and wonderful birds. Joe Krathwohl, more popularly known as “The Birdman”® is our head condor trainer and presents our condors as part of his world class free flight educational bird shows.